In pre-ultrasound days, doctors determined whether a woman was pregnant through a "frog test". For this procedure, the woman's urine was injected into the body of the frog, and from the frog's physical reaction the gynecologist would have an answer. A steady supply of frogs was needed to supply these answers, and the artist's father made his living fishing swamps for this very purpose. In the context of this procedure, the frog's body is the indicator of either life or absence. In the middle of the room on the operation bed the patient/object is already lying. His figure is semi-human but his body and face cannot be seen. He is wrapped in a thick layer of about 200 KG of fresh white dough. He is not moving. The surgeon will open in the dough-stomach a large cavity. His assistants will serve him a big jar filled with water in which living frogs are swimming. The surgeon will pull out the frogs one after the other and insert them into the patient's belly. After finishing the implantation of frogs in the patient's stomach, the surgeon will sew and stitch the dough-belly filled with living frogs. The doctor's assistants will then X-ray the patient. In the X-ray will show the frogs next to the patient's skeleton. The doctor and assistants will wheel the patient lying on the bed to another room. A large industrial baking oven will stand in that room. A team of bakers will wheel the patient/object into the burning oven in order to bake him like a huge loaf of bread. When the baking is done the object will be pulled outside the oven. The baked object/patient will be carried outside of the room. He will be taken to an open park in a pastoral surrounding of lawns and trees. 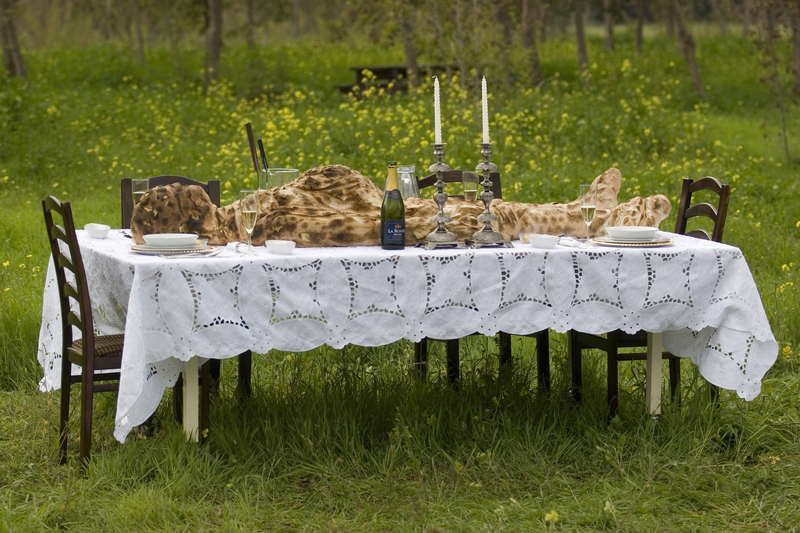 A team of waiters will set the object's bed as a large dinner table. They will garnish the baked object, add champagne glasses and pull chairs around the table. Inviting the spectator to join in and have a piece of the object.